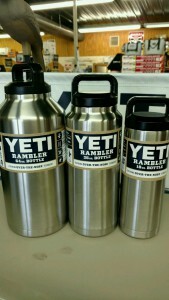 Yeti Rambler Bottles are have arrived at J&N Feed and Seed. Rambler Bottles go wherever there’s a need for ice cold or piping hot beverages. Which we think is just about anywhere. Their Over-the-Nose™ technology makes for easy loading, drinking, and cleaning. And their TripleHaul™ caps are 100% leak-proof and comfortable to grip. Stop by J&N Feed and Seed for Yeti Ramblers, coolers, t-shirt and more! This entry was posted on Thursday, March 31st, 2016 at 3:29 pm	and is filed under News & Updates, News from Max. You can follow any responses to this entry through the RSS 2.0 feed. Both comments and pings are currently closed.